RMB280 per Adult. RMB140 per Child. 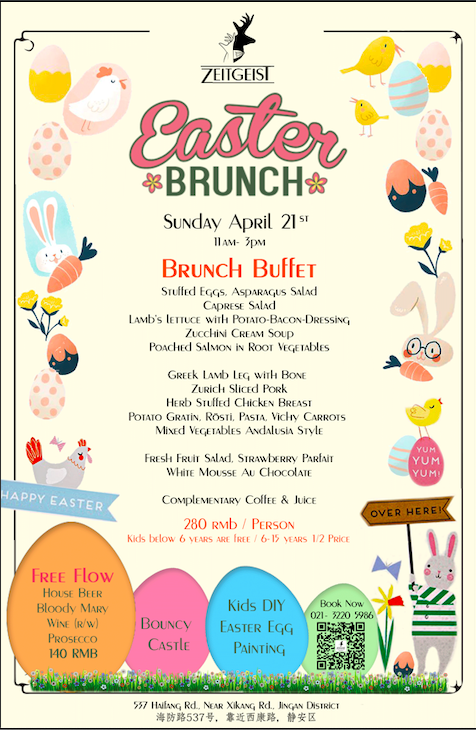 On Sunday April 21, Zeitgeist is hosting a delicious Easter Brunch Buffet including all classic Easter dishes perfect for gathering family and friends. The Buffet runs from 11am-3pm at RMB280 per person for adults & half price for kids 6-15years (kids below 6 are free of charge). For the grown-ups, there's a special free flow option including selected beers, house wines, Bloody Marys and sparkling wine for RMB140. Kids can enjoy the bouncy castle and DIY Easter egg painting.